Navigating SIBO and diet can feel overwhelming and confusing. I know because I have been there. 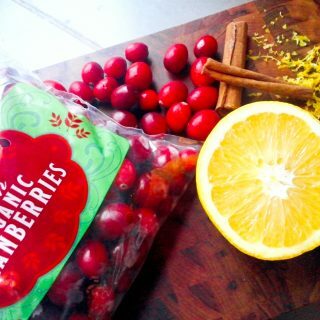 If you search for SIBO recipes on the Internet, you may discover many contradictions. The contradictory dietary protocols make it difficult to find recipes most effective for minimizing symptoms. There’s Dr. Siebecker’s SIBO Specific Food Guide (SSFG), Dr. Jacobi’s SIBO Bi-Phasic Diet, Monash University’s Low FODMAP Diet, The Specific Carbohdrate Diet (SCD), and more! To top it off, some of the recipe blogs out there that say they follow one of these diets may actually have recipes that, unbeknowst to you, stray from these protocols. Even a couple of my recipes are guilty of this–that’s because bananas used to be considered low FODMAP, but when Monash University re-tested bananas, their guidelines changed! 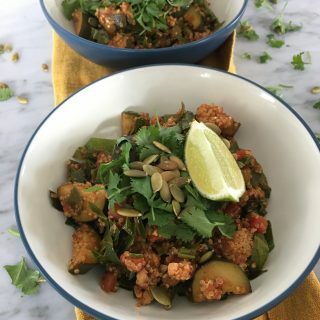 I have found in working with clients with SIBO that the most effective dietary protocol is a real-food-based, low FODMAP diet that takes into account the client’s unique sensitivities. Many of the SIBO dietary protocols are based off information from Monash University’s Low FODMAP Diet. 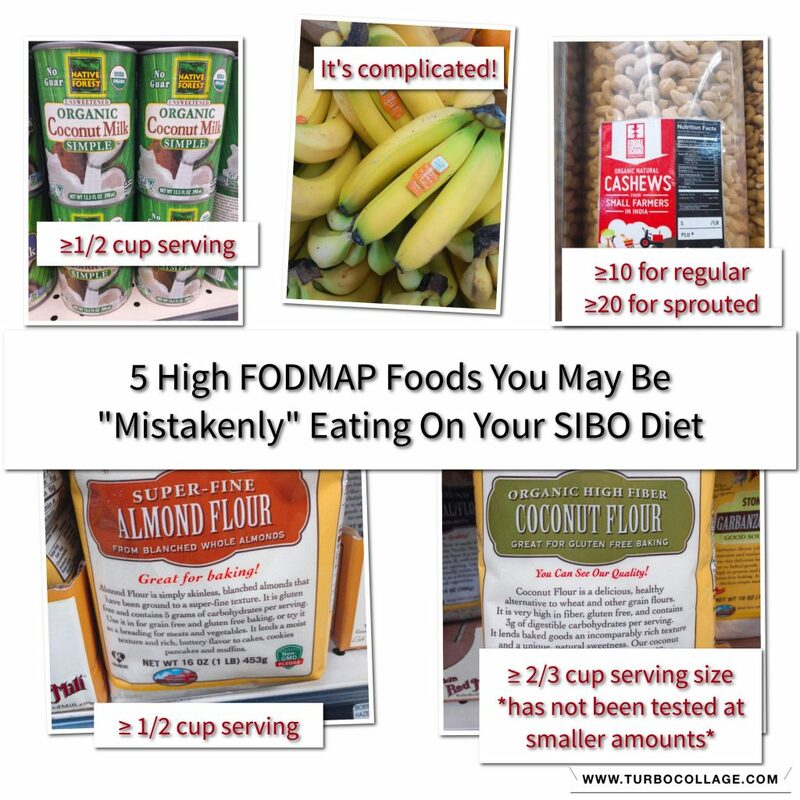 Often, clients come to me already following what they believe to be a low FODMAP or SIBO Specific Diet, but they can’t figure out why they are still experiencing symptoms. Or perhaps they say that they have tried the low FODMAP diet and it didn’t work for them. Sure, that may be the case, but all too often, I see that they were including one or more of the items on the list below. My goal in sharing this list is not to cause you to restrict your diet even further. There’s already too much of that going on in the SIBO world. And it is straight-up unhealthful! 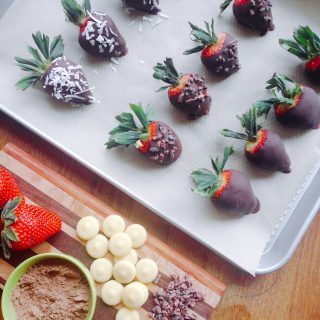 Instead, by sharing this information, I want to get you eating MORE foods. How can telling you about more foods that may bother you get you to a more diverse diet? I like to use the analogy of a bucket when talking about FODMAPs. The bucket gets filled by consuming foods containing FODMAPs. Foods that contain no FODMAPs do not fill the bucket at all. Those that are low FODMAP fill it a little bit, and those that are high FODMAP fill it very quickly. Each unique person has a different size of bucket. And therefore a different tolerance for FODMAP-containing foods. For most people, the bucket gets emptied each night during fasting, or perhaps, every couple of nights if it is filled with foods that take longer to digest. Say you eat one of the high FODMAP foods found below at breakfast each day. Then maybe you are filling your bucket pretty full each morning and find that you have lower tolerance for other foods throughout the day. Perhaps by reducing or eliminating one of these foods, you are able to bring several other foods into your diet. The other reason it is important to know which foods are high and low FODMAP is when you are in the FODMAP elimination phase. The goal is to figure out whether or not you react to high FODMAP foods, so being as strict as possible is necessary in order to gauge your reaction. Once you have finished the elimination phase, however, it is not critical that you follow a low FODMAP diet strictly. But if the low FODMAP diet was helpful for you, then you will have gained the knowledge you need to better manage your symptoms through diet. 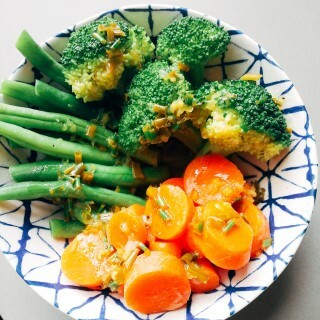 Too often people with SIBO have a mindset that they are permanently damaging their body by eating foods that “feed the bacteria.” This mindset may lead to orthorexia- a condition in which a person becomes obsessed with eating foods that are “healthy” and narrows their dietary diversity to an unhealthful level. To be extra clear, that’s not what I am promoting here! I think the confusion about cashews is two-fold. First, other nuts tend to be low FODMAP at a small serving size, so cashews get lumped in with them. 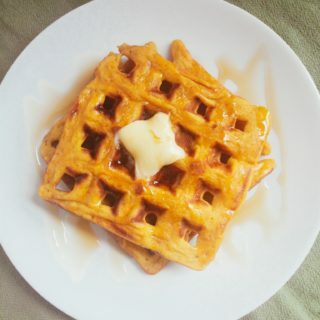 And second, they are so incredibly versatile and a great substitute in dairy-free cooking that a little bit of wishful thinking may be skewing the facts. 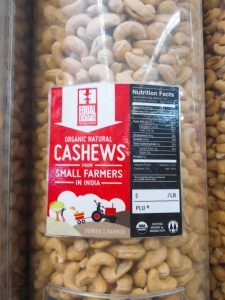 Activated cashews are those that have been soaked in water for a period of time and then dehydrated. It is likely that the soaking process breaks down the FODMAPs so that the activated cashews become easier to digest. 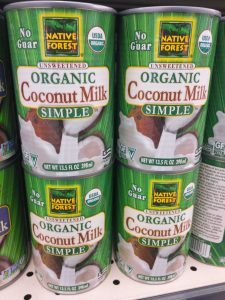 In an effort to avoid the gums in many non-dairy milks (because they are thought to potentially exacerbate SIBO), many turn to canned coconut milk. Some brands are made without gums (such as the type pictured below). According to Monash University, however, canned coconut milk is high FODMAP at a 1/2 cup or higher serving size . Smaller quantities (such as 1/3 cup) are considered low FODMAP. Unfortunately, Monash University does not specify whether “lite” or “full-fat” coconut milk was tested. To be on the safe side, I would recommend using “lite” since it is more watered down than “full-fat” and therefore contains less carbohydrates (and less FODMAPs) per 1/3 cup serving. Basically, canned coconut milk in your coffee or tea? Probably not a problem. Canned coconut milk in your curry? Probably not a problem if you don’t eat too much in one sitting. 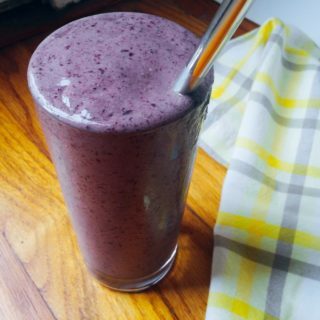 Canned coconut milk in your smoothie? That’s probably pushing it! And if you are wondering whether your homemade coconut milk is low FODMAP, I woud guess that it would be about the same as canned coconut milk, give or take a little depending on your ratio of water to coconut. 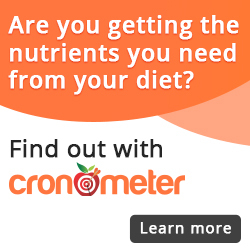 While we’re on the topic of coconut, let’s discuss another coconut-based product that you might be consuming in high FODMAP quantities on your SIBO diet. I want to clarify that the only data Monash University provides about the FODMAP content of coconut flour is that a 2/3 cup serving size is high FODMAP . A person would be unlikely to eat that much coconut flour in one sitting. Most of the time, when someone consumes coconut flour, it’s either in a baked good, a pancake, or as a breading for fish or chicken. In these instances, I would say the quantity used (the serving size) is about 1 or 2 tablespoons. Unfortunately, we do not know whether a smaller serving size such as 1-2 tablespoons is low, moderate, or high FODMAP. 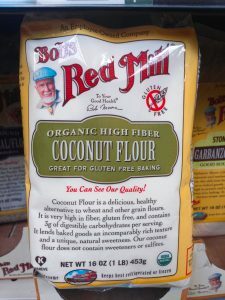 So, if you are trying to test your tolerance to FODMAPs, it might be best to leave coconut flour out of the equation for now. You can always test it later down the road when you have a better sense of your “safe foods” and have figured out your individual tolerance. This is the most confusing of them all. At one point, Monash University had listed bananas as low FODMAP. So you will see “low FODMAP recipes” all over the Internet that include bananas (my site included). Based on the FODMAP content, this information would lead to a conclusion that the best option is an unripe banana. But that’s no fun. Also, green bananas contain resistant starch, which can be troubling for those with digestive issues. 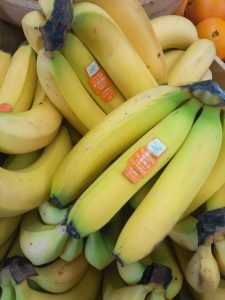 Given that we do not have exact science yet on whether a slightly ripe common banana would be low FODMAP, I would say that for the most part, bananas should be avoided during the elimination phase. If, however, that is just not going to happen (bananas are so good, affordable, and convenient! ), I usually recommend that my clients stick to 1/2 of a slightly ripe (but not too brown) medium banana as a generally safe serving size. 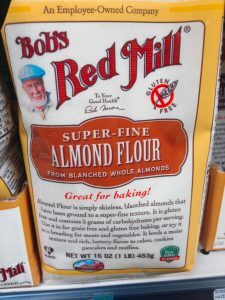 Almond flour is often a staple in the SIBOer’s kitchen! That’s because many sweet treats on the specific carbohydrate diet (SCD) are made using almond flour. And elements of the specific carbohydrate diet are incorporated into some of the SIBO diets. Unfortunately, if consumed in larger quantities, such as in baked goods, almond flour can quickly fill up your tolerance bucket. According to Monash University, a 1/4 cup serving of almond meal (almost the same thing as almond flour, but without the skins removed) is low FODMAP, while a 1/2 cup serving is high FODMAP. I like to use almond flour as a component of low FODMAP baked goods to add extra nutrients such as magnesium, calcium, iron, and protein. I usually also add some sort of lower FODMAP flour, however, such as rice flour, to achieve a more favorable texture and fill less of my FODMAP bucket. As with many of the foods listed above, quantity is the big determinant of tolerability here. Monash University Low FODMAP App. Accessed 03-11-2018.